Children face a significantly greater risk of sleep loss from electronic displays. MelaKids has an explanation for this vulnerability, and a solution with computer glasses that mimics the body’s own blue light filtering system. Ever wonder how long your child should be staring into that bright screen without it affecting their sleep? Melas™ MPF lenses let parents know. Children are exposed to more blue light than ever through their smartphones, tablets, and other electronic devices. Experts have warned that exposure to this damaging light disrupts their sleep, causes digital eye strain and glare, and damages retinal cells increasing their risk of age-related macular degeneration later in life. A study found that when adults and school-age children were exposed to the same amount and intensity of light, the children's melatonin levels fell twice as much (1). Suppression of Melatonin disrupts our circadian rhythm, making it more difficult to fall and stay asleep which could imply numerous health risks. The authors noted that children’s sensitivity to light is most likely due to their crystal clear lenses. Our bodies produce a yellow-brown pigment in the lens of our eye, Ocular Lens Pigment (OLP), which filters harmful blue light and protects the Macula. However, our eyes don’t acquire this beneficial pigment until the age of 30. Meanwhile, more and more blue light is transmitted by the lens of childrens’ eyes that reaches the retina and triggers the suppression of melatonin and this provides one answer to why kids are more susceptible to loss of sleep and increase health risks because of exposure to smart phones and other electronic devices. Melas™ MPF Computer glasses use patented lens technology that contain two pigments that the body naturally produces to protect the eye from blue light and glare – Ocular Lens Pigment (OLP) and Melanin. MelaKids licensed the lens technology from Photoprotective Technologies, Inc. (PPT) that produces a synthetic version of Ocular Lens pigment (OLP™) that preserves the same spectroscopic properties of the OLP that occurs in the lens of our eyes; and Melanin, our natural sunscreen that reduces glare. Melas lenses also utilize PPT's Melatonin Production Factor™ (MPF), a patent-pending rating system that quantifies the ability of blue-light-filtering computer glasses to preserve the night-time production of melatonin. A lens with an MPF value of 3, for example, means that you can use the iPad 3 times longer with that lens – or 6 hours – to get the same 22 % loss of melatonin that you would get without that lens. 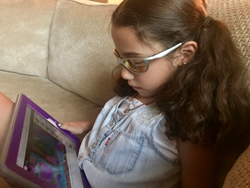 Melas™ computer glasses provide children with the natural protection that they don’t have to fight against the harmful effects of blue light. Developed by Nature, OLP and melanin filter blue light in our eyes without compromising the perception of color.